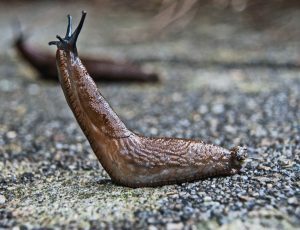 There are around 30 different species of slug in the UK, which provide a food source for other predators such as birds, hedgehogs and even toads. Slugs have an important role in the ecosystem and are key composters which help to break down decomposing vegetation. However they are notorious for being able to chomp through garden plants and vegetables in a very short period of time. They do this using their teeth! Slugs average approximately 27,000 ‘teeth’. They need so many teeth because instead of chewing their food, they have a ribbon-like flexible band of microscopic teeth called a radula. This acts like a circular saw — cutting through vegetation and eating it as they go. When their teeth wear out new rows of teeth move forward and replace them.